The days of considering a leisurely Sunday afternoon drive as a peaceful refuge from a busy week are clearly over. Now, we expect to be able to take our hyperconnected lives with us on the road, and if we can tell our cars exactly how and who to connect with, all the better. 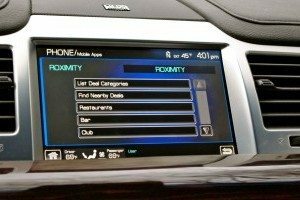 In the face of this new reality—as well as data that says 50 percent of its customers consider the SYNC platform to be a major factor in their purchase decision—Ford has rolled out apps from Pandora, NPR, and now Roximity that use voice-activation technology to integrate users’ smartphones and the vehicles they drive. Denver-based Roximity is a location-based “daily deals” service. The startup was hatched in 24 hours at last year’s TechCrunch Disrupt Hackathon, where it went on to win the Ford SYNC App Developer Challenge. That gave Roximity access to Ford’s SYNC AppLink API so the team could make its software compatible with the in-vehicle connectivity system. In January, Ford and Roximity debuted a demo of the new app at the Consumer Electronics Show in Las Vegas; earlier this month, the automaker announced Roximity was ready for launch—and it’s the first app to have AppLink capability, Ford’s hands-free, voice-controlled mobile connectivity technology, at its initial launch. Roximity is a request-driven system, and when users sign up, they’re presented with a list of deal categories to choose from, such as breakfast restaurants and women’s clothing. As users pass by a store or restaurant offering a discount they might be interested in, a text message is sent alerting them to the deal. In the car, drivers can connect their smartphones to SYNC, activate AppLink, and, through voice-activation technology, ask which deals are nearby in the designated categories.